The manufacturer of a common infants’ over-the-counter pain medication is pulling some of its products off the shelves of several big box and discount stores, over concerns that the affected products might be too potent for infants to take. Late Wednesday night, Tris Pharma announced a voluntary recall of three lots of its infants’ liquid ibuprofen products, all of which can be administrated via oral syringe. The recall includes store-branded 0.5 ounce bottles sold across three nationwide chains: Walmart, CVS, and Family Dollar. According to the company, the recall was prompted by the discovery that some bottles in these lots might have higher levels of ibuprofen than labeled. A full list of the affected lots and their identifying information can be seen here. Ibuprofen and other nonsteroidal anti-inflammatory drugs (NSAIDs) are known to slightly increase the risk of kidney damage even when taken as recommended. But infants who are already more vulnerable to this side-effect could especially be at risk of permanent kidney damage. The common symptoms of ibuprofen overdose in infants, according to the company, include nausea, vomiting, and stomach pain. Infants might also come down with less common symptoms like diarrhea, tinnitus (chronic ear-ringing), internal gut bleeding, and headaches. Currently, however, Tris Pharma claims that it hasn’t received any reports of adverse events or illnesses linked to the recalled lots. 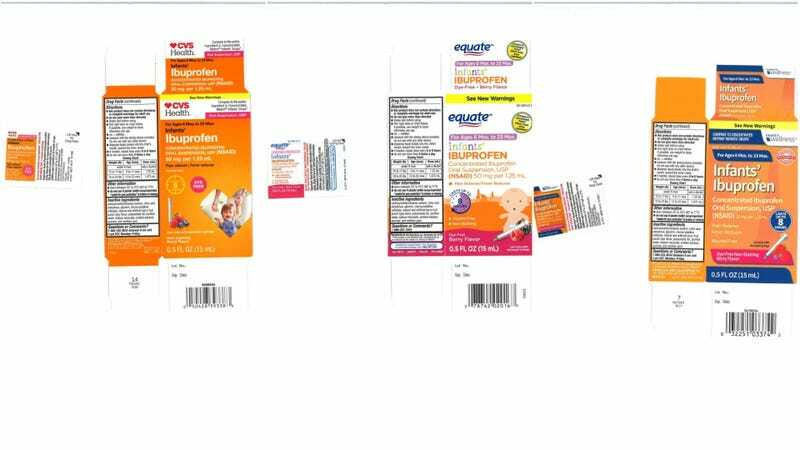 The recall is actually the second to involve children’s ibuprofen products this year. In April, Pfizer recalled one lot of its bubble gum-flavored Children’s Advil liquid bottles from stores. Rather than too much ibuprofen in the products, though, the problem was that the wrong dosage cup was included. The labeling instructions called for parents to give doses measured in milliliters, but the dosage cup came with measurements of teaspoons. Since teaspoons are about 5 milliliters each, that could have raised the risk of an overdose. As for now, any parents who believe their child might have been affected by the recalled lots should reach out to their local doctor or medical provider. They can also submit their experiences to the Food and Drug Administration’s MedWatch Adverse Event Reporting program through the mail or online. The headline of this article has been updated to clarify that infants’ ibuprofen is affected by the recall (the previous headline referred to children’s ibuprofen).